In this day and age and with many prepackaged technologies available, you would think that a custom-built site or software would be a rarity. While it isn’t something we see every day, we have certainly run into our fair share of custom-coded environments in need of some help. 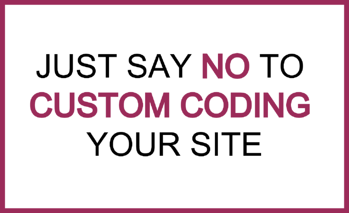 So, before you kick off a custom technology project, whether it’s ERP or eCommerce, give some thought to a few of the reasons you shouldn’t custom code your site. One of the key reasons to use a prepackaged software is the ongoing support and new features continuously added to that offering. Patches, bug fixes, security enhancements, product growth; all of this is available with a prepackaged software. When you run a custom-built system, if you don’t think to include something it simply isn’t available. Typically, you’re writing exactly what you need in that moment and not necessarily what you may want or need in the future. Also, other users might request additional features that you didn’t even think about. When you work with a packaged software, you’re getting access to a whole suite of features to implement now or later. As a large packaged software, Magento has an established cadence for updates and security releases. Magento has monthly security patches and substantial feature releases and version upgrades a few times a year. Your environment isn’t static because new features or fixes are always being developed. With every release cycle and substantial new feature, you have access simply because you paid for the software. The security releases are perhaps the most crucial aspect of working with a packaged software. Keeping your site secure and updated can be a taxing job, but working with a software like Magento means the work is done for you. All you have to do is download the patch. Every software has bugs; it’s a risk of maintaining updated technologies. Basically, your site is either going to have bugs and the latest features, or no bugs and features that are decades old. In addition to the releases available through Magento, working with the software gives you access to the user community and various technology partners. These resources are great when you discover that you’re in need of updated features or additional functionality. Instead of having to build something new from scratch, you have access to modules and configurations from the Magento community. Similar to Magento, JD Edwards releases periodic major releases that bring out new features that add to existing software. When a fix is required, you can just download the update, run it through testing, upload it to production, and go back to business as usual. Others will have already vetted the update, making the risk much lower than trying to update a custom ERP environment; if you build your ERP yourself you’re always the first and only company on that software and testing those updates. Keeping up with enhancements and the latest technology is easy when JD Edwards is providing you with those updates, instead of having your team build everything from scratch. You can rely on JD Edwards and the surrounding community for bug fixes and new features, whereas with a custom system you have support only from those in the organization who built it. When they leave, what happens? You’re essentially held hostage by the development team that built your environment. As we mentioned above, one of the big advantages of working with a packaged software is the wealth of partners and community members available. Having an established user community is helpful for support as community members share their user experiences, tips, and techniques in using and implementing the software. It’s also a key resource for hiring new team members. When working with a custom environment, chances of finding someone who has used your technology for your particular purpose are slim to none. Instead of hiring someone and spending weeks getting them up to speed on your environment, both the Magento and JD Edwards communities boast thousands of users who are familiar with your software. The best thing about the Magento user community is that no matter the situation, there’s most likely someone out there who has had a similar experience. Your question has been asked before and, more often than not, an answer is available. The Magento developer and partner community is teeming with complementary software products that can integrate with Magento out of the box. Instead of building a new feature from scratch, you can install a vetted third-party module. These developers also often contribute to Magento’s updates, meaning that you have tens of thousands of developers behind a single feature. Aside from additional available features, the Magento community boasts solution implementers, and solution and hosting partners that are vetted and certified by Magento. So, if you’re working with a technology partner but you aren’t happy with their performance, you have a wealth of options to choose from instead. With tons of partners to choose from and Magento’s recommendations available, you’re more likely to find the best match for your project. And, if something does go awry, you always have another option. The JD Edwards user community is a great resource for supplementary information and advice. There are groups like JDETips and JDEtables.com that provide training and documentation materials that supplement what Oracle provides. These community-run organizations are a great place to seek answers and solutions to JD Edwards challenges. Much like Magento, JD Edwards also has an implementation community with thousands of partners available to work with. Additionally, JD Edwards holds an annual partner summit where that community can get together to trade ideas and share experiences. Most custom-built software wasn’t initially designed for integration with another system. It’s very difficult to integrate with another system if it wasn’t set up for that purpose in the first place. Not only that, even if you are able to figure out how to integrate your systems, you’re guaranteed to have to custom build everything in the integration as well. Packaged software is typically built to make integrations with other systems convenient. and attempt to integrate with another system if it wasn’t set up for that purpose in the first place. Not only that, but even if you are able to figure out how to integrate your systems, you’re guaranteed to have to custom build everything in the integration as well. Packaged software is typically built to make integrations with other systems convenient. Magento has a whole architecture of integration and queuing of data as it flows to and from your site. There are existing API communication layers and data load processes to extract and communicate data from Magento outward. Every functional area of Magento is primed for an integration. And, if you do have questions about an integration strategy, there is a ton of available information within the community about how Magento functions. Most custom ERP systems were designed so long ago that the architecture, especially at the database level, simply can’t handle an eCommerce integration. JD Edwards or any other packaged ERP has all of the necessary integration points built in so you don’t have to custom build the APIs and add the JAVA layer on top. With a system like JD Edwards, it’s all there: dedicated communication layers, industry standard formats, and REST and SOAP capabilities. Having access to all of those points makes an integration project much more manageable than if you were trying to internally work on a custom environment. Testing always runs the risk of being a treacherous phase because, honestly, you could break something at any time. The good news is that a packaged software has been battle tested by thousands of users before you. Everyone from small mom-and-pop organizations to huge retailers have tested every feature, broken it, and brought it back to life. With a custom environment, you’re guaranteed to be the first and only company running that code, which is a scary thought. Magento has over 250,000 websites on their platform. Right there you know that hundreds of thousands of users have tested the software on a production environment and uncovered bugs before you even launched your site. With that many people vetting and correcting issues, you’re much more likely to have the support you need during the testing phase of your Magento project. When it comes to testing JD Edwards software, you can rest easy knowing that everything has been vetted by Oracle before it was released, meaning there’s a base layer of technology that will work right off the bat. There might be the occasional bug, but the system will work. That confidence helps going into testing, but Oracle also has additional tools that can expedite the testing process and tie into your software. Still Thinking About Going Custom? Essentially, your company needs to evaluate your technology team and determine if they’re prepared to take on a custom project. How good is your team at documentation, patches, security audits, testing, and everything else that goes into developing and delivering a software? How good are they at simply managing your current software? Requirements and definitions alone are tough, how will your team handle adding development onto that as well? Will taking on a custom project detract from or add to your execution of corporate goals? With the time and effort required to build a custom piece of software, why not apply those resources towards a packaged software solution? Not only will you have access to more support, you’ll get way more features and functionality than with a custom environment. Ready to get started implementing Magento or JD Edwards for your organization? Contact our experienced implementation teams. Bill Onion is Managing Director of Briteskies, where he has a distinguished track record helping B2B and B2C companies integrate e-commerce solutions. His expertise in the eCommerce world includes Magento and WebSphere Commerce software systems and his enterprise software experience is focused on the Oracle/JD Edwards platform. Bill has many years of consulting experience in various industries, including distribution, warehousing, retail and manufacturing. Bill is an avid runner, is very involved with Scouts, and cannot help but to root for the Browns every fall.